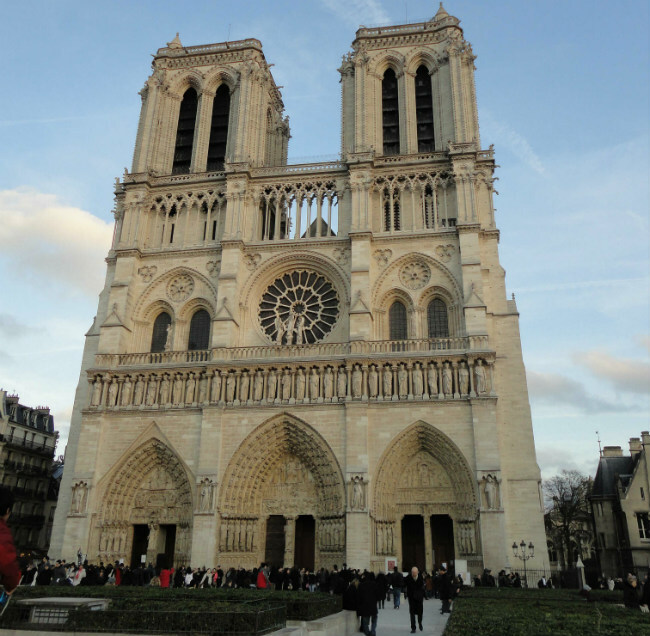 Few buildings have achieved megastar status like Notre Dame de Paris. But despite the daily barrage of paparazzi outside her door she’s managed to keep her best secrets hidden from the masses. Here’s an inside look at hidden details and anecdotes you never knew you never knew about the coolest cathedral on the continent. 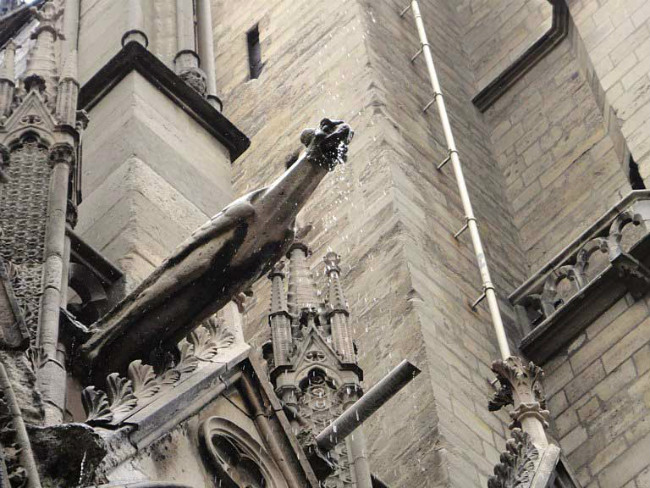 Besides scaring away evil spirits and reminding sinners of the demons awaiting them in Hell, gargoyles originally served a practical purpose as rain gutters. Still today, water from the roof travels along the grooved back of each creature until it’s spat out of their mouths, far enough away to keep the building’s foundations dry and solid. The coolest part? This secret function is evident in the word gargoyle that we use today; it comes from the French verb “gargouiller” which means to gargle water in your throat. So it’s simple really—any stone creature that doesn’t gargle—no matter how nasty and gnarly—is a big fat faker. Get the best view of these legit gargoyles by walking along the building’s northern exterior. 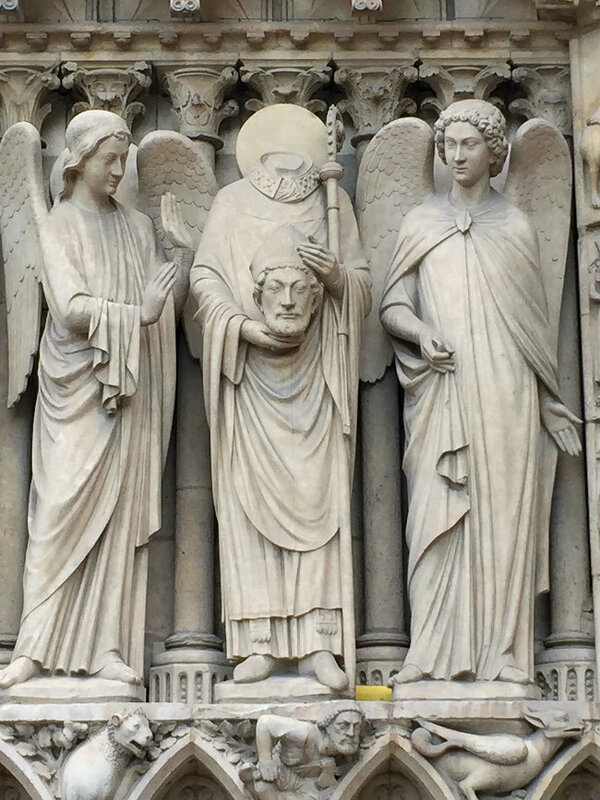 Before Marie Antoinette nabbed the top slot for Most Fabulous French Beheading, there was Saint Denis. Legend says that in 250 A.D. the Romans caught him preaching Christianity here and ordered that he be decapitated at the top of Montmartre. But it was a scorcher that day, so the fatigued soldiers decided to do the dirty deed halfway up the hill. Enter the miracle: Denis’ headless body gets up off the ground, picks up its own cranium, and proceeds to walk several miles—while the head gave a sermon! Fun fact: many believe this event gave Montmartre its name, being a derivative of the French words for “mountain” and “martyr”. 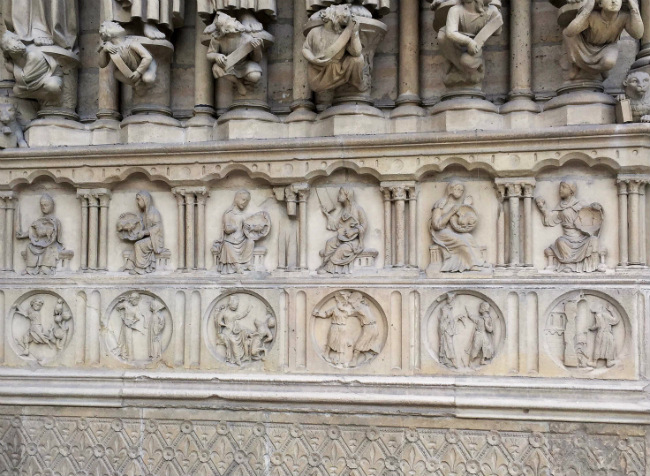 Find Saint Denis on the left-hand doorway of Notre Dame’s western facade. In the mood for vast riches and everlasting life? Notre Dame can lead you to it, according to some. Legend has it that hidden messages were embedded in the façade which when deciphered will lead you to the Philosopher’s Stone, a mystical object that transforms any metal into gold and provides immortality to its possessor. Example: the round medallions at the main entrance purportedly spell out the secret steps of the Philosopher’s Stone recipe. Decode them all and voilà—you’ve got the next several millennia to look forward to. You may even live long enough to see Parisians learn to clean up after their dogs. These medallions adorn both sides of the cathedral’s central doorway. Unlike the less-than-savory slave practices that bore Egyptian pyramids and Roman temples, most of Notre Dame’s workers were paid artisans. But in order for workers to cash in on those famously deep pockets of the Catholic Church, a reliable payment system was a must. Because of this, each stonemason created a personal insignia that was pounded into every block he sized, ensuring proper reimbursement at the end of the day. Though most of these voices from the past have faded over the last 800 years, a little bit of Sherlock-ing will reveal several hidden survivors. 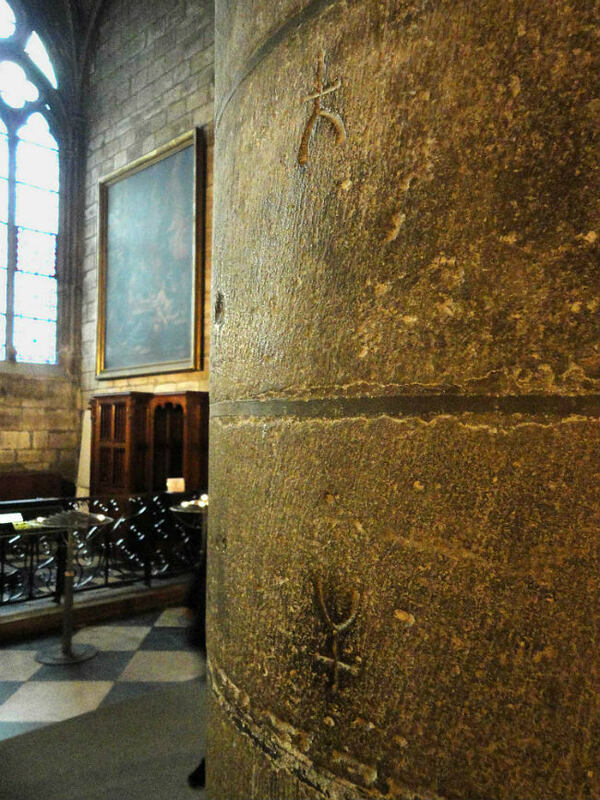 Find these symbols in the round columns along both side aisles (where the chapels are located). 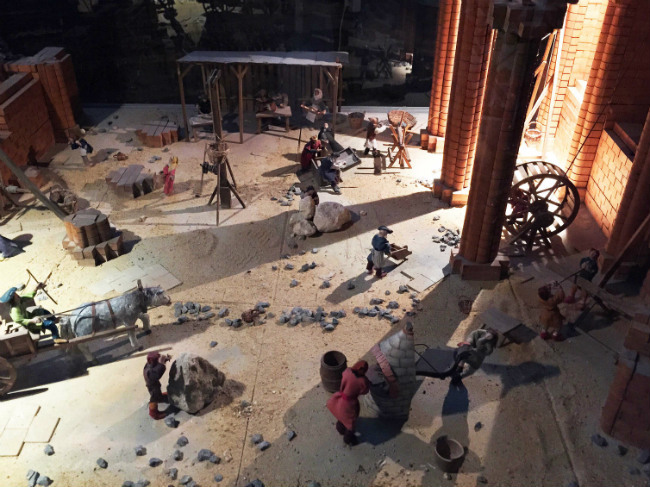 A small model inside the church sheds light on the ingenuity of the medieval mind. In a time when Home Depots were few and far between, individual work stations provided the construction site with all necessary materials. Rope? Handmade onsite every day. Nails? Hit up the resident blacksmith. Need to replace a broken thingy? Go see the thingy guy. Also on display is a medieval crane, seen on the right-hand side of this picture. It was essentially a large wooden hamster wheel that required workers to get inside and “treadmill” each hunk of stone up to vertiginous heights. Imagine the number of stones that make up a cathedral, then ponder cranking them up one by one. A job for the interns, surely. You’ll find the model behind the altar in the back of the cathedral. Very interesting and amusing. Love the picture of the stone mason’s identification symbol. Notre Dame has some serious magic. Long ago site of a temple of Zeus, if I remember correctly. Of course most of the west front decorations are actually from the Viollet le Duc restoration, not at all original. That doesn’t stop me loving it though. Haha, great article. I just saw the cathedral and this article brings it to life. I wonder if the “dizzy angel” is OK. You could see her(?) if you walked east from the pensive gargoyle, turned the corner and looked slightly down. I can’t recall if she was on the spire or on another structural member, and my photo was tightly focused on her, so that’s no help, either.